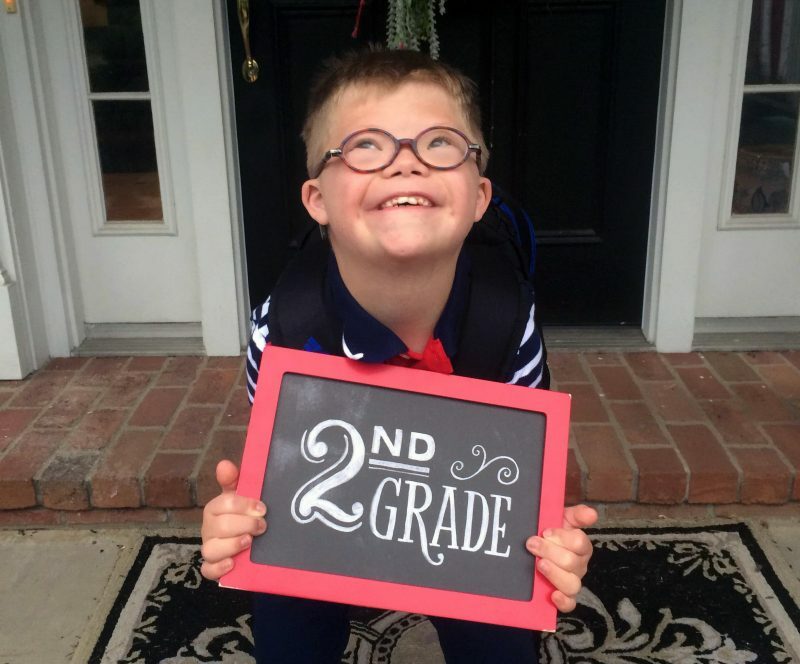 Joey, who has Down syndrome, went back to school with a resume and letter to highlight his strengths and weaknesses. Returning to school each fall is a time of both excitement and nervousness for parents and students. For parents who have a child with special needs, this time of year can bring increased anxiety and stress. All of his teachers, aides and therapists have a copy of his IEP each year, but if you have ever read an IEP you know how difficult they can be to read and how long they are. 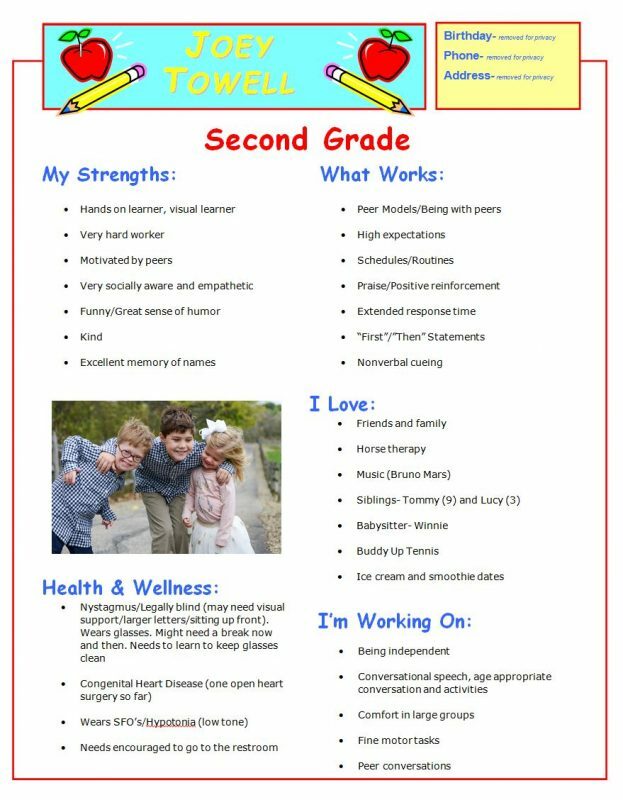 We designed Joey’s Resume to be a quick one-page information sheet that provides some helpful tips and highlights Joey’s strengths. When you have a child with a learning or physical disability, it is easy for people to focus on what your child is unable to do. We wanted to shift that focus and help educate people on what Joey is able to do and what we expect him to do at school. Dr. Lindsay says this snapshot of your child can help teachers quickly come to terms with what they can do to help your child have a smooth start to school. “While a resume should not replace a legally binding document such as an IEP or Section 504, it may be a great way for teachers to get to know your child before they even enter into the school building,” said Dr. Lindsay. “This could be a particularly excellent tool for children entering a new district or building, for children who may not readily communicate this information verbally, such as children with language needs, children on the autism spectrum or children with anxiety. Dr. Lindsay said she loves the positive focus of Joey’s resume and recommends parents remember to include strengths and not just weaknesses. Joey with his siblings Tommy and Lucy. We thought that this would be a quick and accessible means for people who will interact with Joey to have a better idea of what kind of learner and what kind of communicator he is. The entire resume is very positive and we hope it gives a quick snapshot of him as an entire person so the focus isn’t just on him having Down syndrome and learning disabilities. Once his resume is ready to go I make about 30 copies of it and give it to every teacher (including gym, art, music, library, etc. ), aide, bus driver, principal, therapist, cafeteria employees and custodians. Our hope is that his resume will take away any fears or unknowns that anyone during the school day might have if they are not familiar working with a child with a disability. One of the challenges of mainstreaming is making sure your child’s peers understand what makes your child unique. 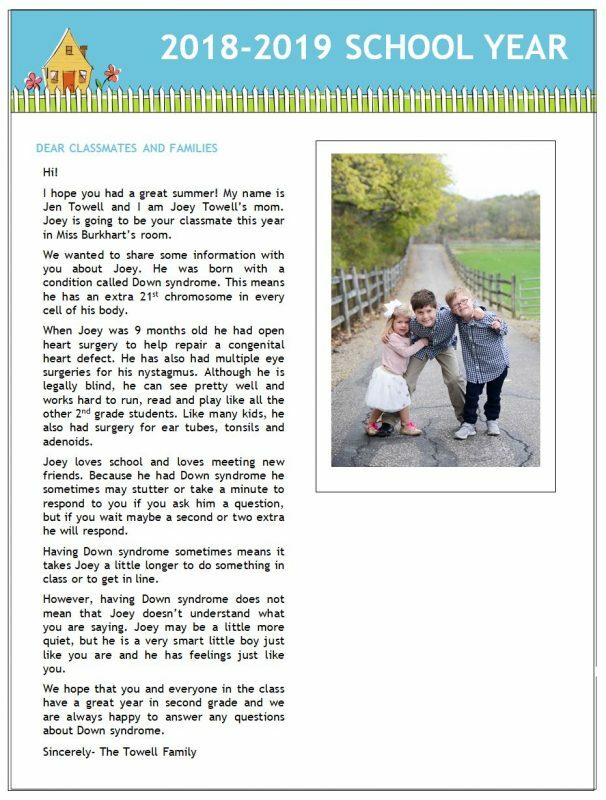 This year we added another element and we wrote a class letter to Joey’s peers and parents in his typical second grade classroom. He spends about 60 percent of his day in the resource room working on intense learning and one on one instruction and about 40 percent of the day in a typical second grade classroom. It was around this age that our oldest son, Tommy, started to ask more questions about what Joey has and what Down syndrome is. 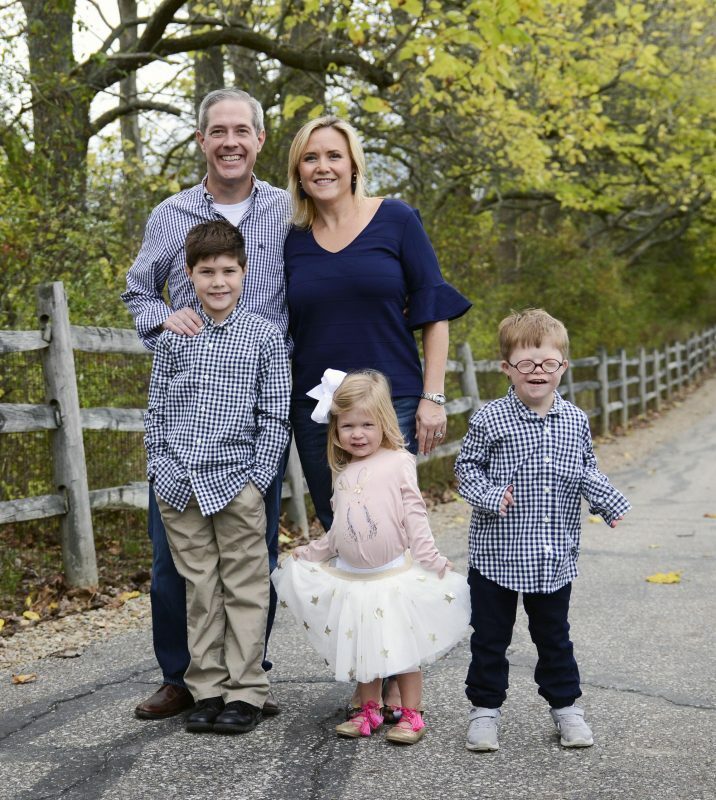 We wrote a short three paragraph letter introducing Joey and talking a little about what Down syndrome is and offering to answer any questions students or parents may have. 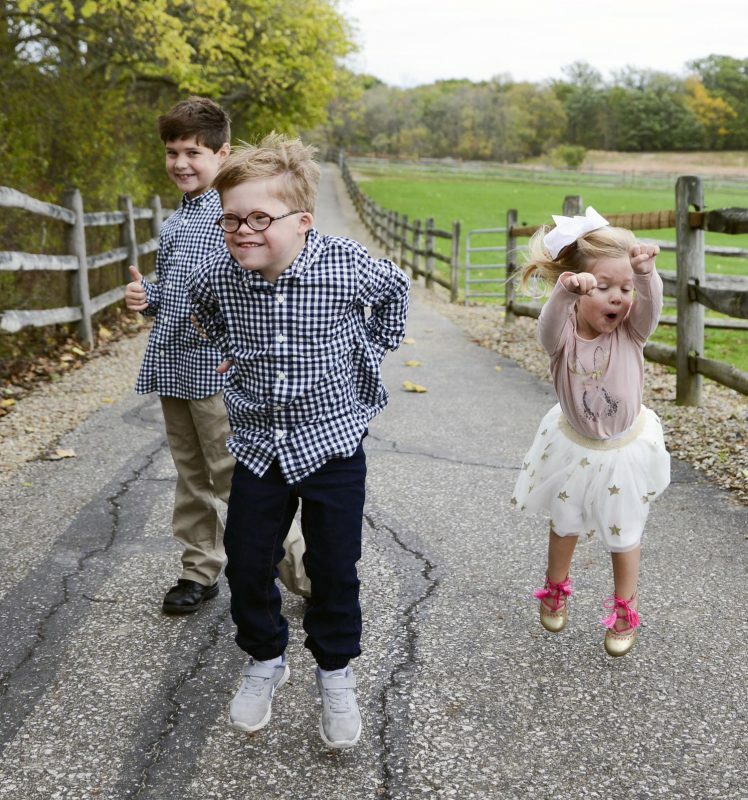 I ended it by saying that just because Joey has Down syndrome does not mean that he doesn’t understand the other kids or doesn’t want to play with them- it just means that sometimes things might take him a little longer, but the best part of his day is going to school and being with friends just like any other classmate. When we met with Joey’s resource room teacher and his 2nd grade teacher at Richfield Elementary School last week, we gave them his resume to distribute and the class letter and they were really happy. One teacher said she could use a resume for every one of her students. After sharing it on Facebook, I heard from many moms who wanted to do the same for their child and I have been emailing the documents out to help other families create their child’s resume. Every parent wants their child to have a successful and happy school experience. With a little creativity, we can help prepare the school community for just how much our kids with disabilities can knock their socks off!